The Trump administration has backed Israel's claim to sovereignty over the Golan Heights. The move comes weeks before Israeli general elections and reverses the position U.S. administrations have held for decades. "After 52 years it is time for the United States to fully recognize Israel's Sovereignty over the Golan Heights, which is of critical strategic and security importance to the State of Israel and Regional Stability!" the president wrote. Under the Trump administration, the U.S. has repeatedly endorsed controversial Israeli positions. In early March the U.S. closed its Jerusalem Consulate, which has been the lead diplomatic mission to the Palestinians, NPR's Daniel Estrin reported. It folded that job into the U.S. embassy to Israel. Last year the U.S. moved its embassy from Tel Aviv to Jerusalem and backed Israel's assertion that the city is its capital. Palestinians claim part of the city as the capital of their future state. Previously, the U.S. held that the status of the city would be determined in peace talks. After the U.S. moved the embassy, Palestinian leaders cut contacts with the Trump administration. Trump's Golan Heights announcement came as Secretary of State Mike Pompeo visited Jerusalem. Pompeo said the move was "truly historic." 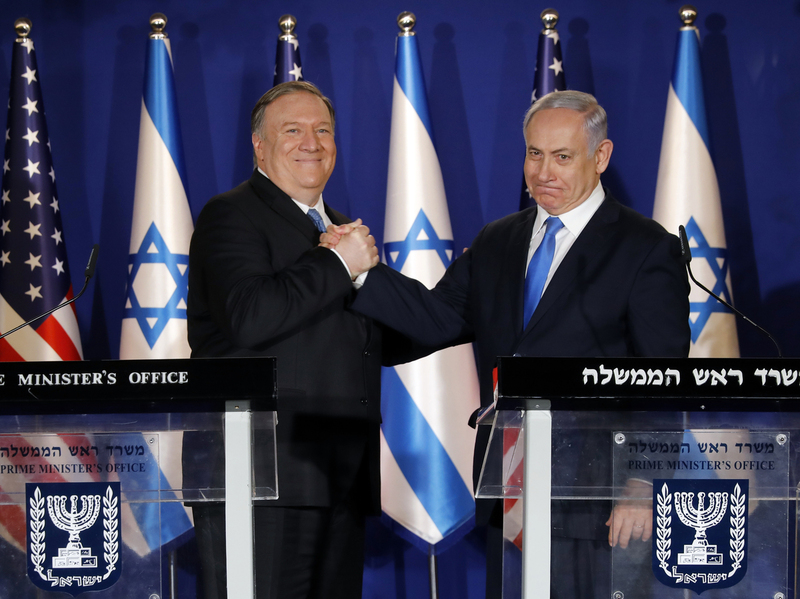 "President Trump made a bold decision to recognize that, an important decision to the people of Israel," Pompeo said. Pompeo was hosted by Israeli Prime Minister Benjamin Netanyahu, who praised the decision to recognize the Golan as a "miracle" during the week Jewish people celebrate the holiday of Purim. Netanyahu faces reelection in April, and he contends with corruption allegations and a rival who has tapped into the public's fatigue with a decade under the same leader. "U.S. policy as it relates to the Golan Heights has been probably been one of the most consistent and long-standing positions we've had on any Arab-Israeli issue," said Scott Lasensky, former advisor to the U.S. ambassador to Israel under the Obama administration. Lasensky said Trump's move seemed to be "totally devoid of strategic imperative" and possibly aimed at helping Netanyahu win the vote. The Israeli leader visits Washington, D.C. next week. Palestinian peace negotiator Saeb Erekat panned the Golan announcement and said U.S. policy would bring "bloodshed in our region".